Beyoncé and Jay Z are giving us all anxiety. You know it's true. The rumors that the king and queen of life are on the verge of a divorce keep getting louder and more detailed, so it's hard to know what to believe. Beyoncé sure seems to be trying to convince us otherwise with her Instagram posts and Jay Z and Beyoncé are incredibly affectionate on stage and off it, but they are also in the middle of putting on a show. How are we supposed to believe their carefully constructed photo opps when it's the same gambit that Beyoncé used to try to steer us away from Elevatorgate before she released a joint statement? TMZ might have just helped assuage our worries a little bit. They found a private picture of Jay Z and Beyoncé at a party that could be all the proof we need that they're going to be just fine. The party was being thrown by Gloria Carter, Jay Z's mother, to celebrate the opening of Diamondz N Da Ruff, a restaurant in Newark. According to TMZ, Jay Z and Beyoncé were there for about 15 minutes on Saturday, but their presence there wasn't advertised or pre-announced. In fact, we never would have known they were there if TMZ hadn't stumbled across this picture. The whole reason that Beyoncé and Jay Z's happiness has been so hard to swallow is that their photographs and public displays of affection are so out of character as to seem almost forced. Oh, they've always been affectionate, but it's starting to seem that at least half of the pictures from the On the Run Tour have to be of Beyoncé and Jay Z looking as in love as possible. In this private family picture, however, the pair look relaxed and happy. They're not all over one another in the showy way we've become accustomed to from their tour and Instagram pictures, but they certainly don't seem at odds with one another the way the papers have been reporting. 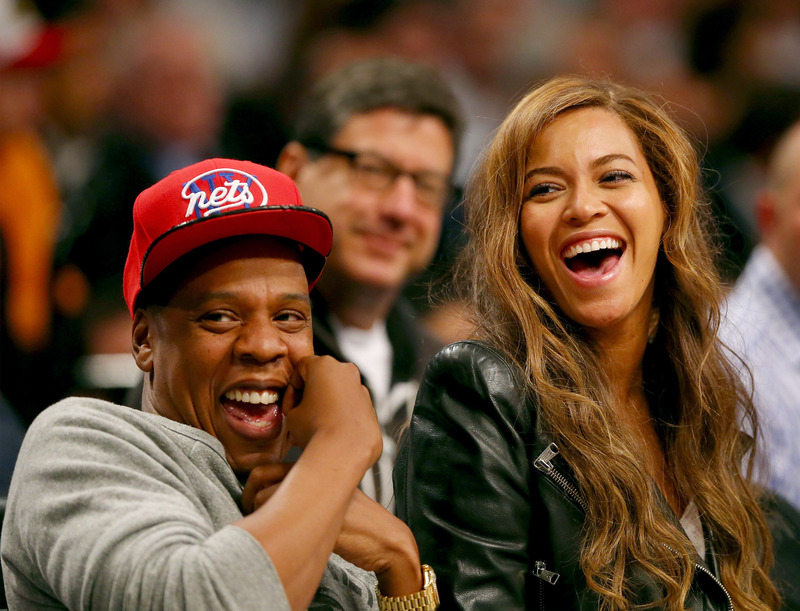 Basically, if Beyoncé and Jay Z are having 99 problems, then this party ain't one. There's the possibility that they could just be putting on a show for Jay Z's mother — especially since TMZ had sources at the party who were able to report that "Beyoncé and Gloria hugged and laughed" — but that seems like a lot of trouble to go to on what was clearly their downtime. The worst case scenario is that this picture and this story can be taken as proof that, even if they are about to divorce, then Beyoncé and Jay Z have every intention of remaining friends afterward. There can be no doubt at this point that Beyoncé and Jay Z's divorce is going to cause massive grieving across the country as people dissolve into a depression that couldn't be greater even if it was their own marriage coming to an end, but it's moments like these that give hope to the hopeless that Bey and Jay will survive in some capacity. We might not know for sure yet if they're planning to separate, but until they do they're still partners and that's going to have to be good enough for their fans.